Over 30 million people are blind in both eyes, with another 200 million patients with significant loss of vision in one or both eyes. This is an unnecessary tragedy - 80% of this vision loss is preventable or treatable. Dr. Ambati will share his journey in vision research and global health by showing how ocular biology and drug delivery can be married and employed to combat the principal challenges of our time in the world of vision - cataract, corneal scarring, macular degeneration, and diabetic retinopathy. He will discuss his laboratory's innovations in drop-free cataract surgery, targeted intraceptor nanoparticles for macular degeneration and corneal transplant rejection, and neurovascular restoration in the diabetic retina. He will also lay out the landscape and opportunities in eye research and global blindness. Dr. Bala Ambati is a cornea specialist with a research focus in angiogenesis. Splitting his time equally between clinic and research, his most significant basic science research advances have been the identification of sFlt-1 as the prime mediator of corneal avascularity (published in Nature and recognized by Science as a Signaling Breakthrough of the Year) and the development of Flt-1 intraceptors as a novel intracellular anti-VEGF therapy, of significant impact as current anti-VEGF agents work only extracellularly. Dr. Ambati's team is presently focused on the role of sFlt-1 in maintaining ocular vascular demarcations, work which was awarded the 2012 ARVO/Genentech Award for Research in Macular Degeneration, the 2013 Troutman-Veronneau Prize & the 2014 Ludwig von Sallmann Clinician-Scientist Award. In collaboration with Dr. Uday Kompella, targeted nanoparticles delivering Flt-1 intraceptor therapy have demonstrated significant anti-angiogenic activity in corneal, retinal, and cancer models in multiple species. Clinically, Dr. Ambati was the first to describe use of bevacizumab (Avastin) to treat corneal transplant rejection. He has developed key surgical innovations and is developing transformational ocular drug delivery implants which will serve as a versatile platform for treating macular degeneration, glaucoma, and other diseases by sustained release of multiple drugs from within the lens capsule. This will mark a major advance over the use of intravitreal injections or complex regimens of topical polypharmacy. He was recently cited at the #1 eye surgeon in the Top 40 under 40 global competition by The Ophthalmologist magazine. 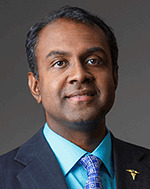 Dr. Ambati has been recognized for his teaching excellence by a University of Utah Resident Research Mentor Award, the Gold Humanism Award, and by serving as an Instructor at the Harvard Cataract Course for 2009 and 2010. His community and overseas service is consistent and giving: he has conducted free eye screenings in New York, Georgia, and Utah, and served as a volunteer eye surgeon with ORBIS, Sight for the Sightless, and Help Mercy International in Ghana, Zambia, India, the Philippines, and Malaysia.